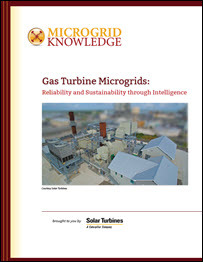 A gas turbine microgrid at a Texas hospital benefits the larger community, thanks to a utility/customer partnership, as we explain in this excerpt from Gas Turbine Microgrids: Reliability and Sustainability through Intelligence. 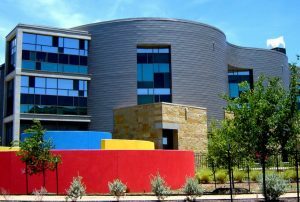 When Seton Healthcare Family was planning the Dell Children’s Medical Center in Austin, Texas, reliability was an imperative, but they did not want it to come at the cost of their sustainability goals. In a medical care facility, both objectives are primary. Losing electrical power for critical services or during an operation is not an option. But holding down costs and providing a healthy environment for patients, staff and visitors is also important. To meet both needs, Seton chose to power their new facility with a combined heat and power (CHP) plant that would not only provide power, but also capture waste heat from the combustion process to provide district heating. The CHP plant, known as the Mueller Energy Center, is owned and operated by Austin Energy, the local municipal utility. It was built on a three-acre brownfield site, an old municipal airport, and scaled to meet Dell’s energy needs. At the heart of the CHP plant is a Solar Turbines 4.6-MW Mercury 50 gas turbine generator. The waste heat from the turbine is recycled in a heat recovery steam generator to produce 22,000 pounds per hour of steam and chilled water from a 900-ton Trane two-stage absorption chiller. Adjacent to the CHP system are two centrifugal chiller plants, standby steam boilers, and a thermal energy storage tank. The energy center also includes a 1.5-MW backup diesel generator with black-start capability. 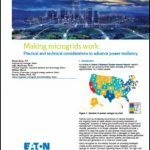 If there is an outage or an interruption in grid electrical service, the gas turbine microgrid can continue to run, providing all of the hospital’s needs for power, steam and cooling, an important consideration in July and August in Austin. The ability to island its electrical service was an important consideration for Seton. It allows the hospital to continue to operate if there is a grid failure. During a disaster, the hospital becomes a place of refuge and a center for medical care. According to one study, the probability of failure for a traditional hospital grid-plus-backup system is 67 percent. Having the Mueller Energy Center flips that equation for Seton. The gas turbine microgrid, in fact, provides more energy than the medical center needs. “We actually export power,” said Barrett Story, a supervisor at Austin Energy and the operator of the Mueller Energy Center. “The gas turbine is the primary source of power for the hospital, but it doesn’t run by itself,” Story added. The hospital is backed up by two electric feeds from different substations in the surrounding power grid. Excess electricity from the energy center is exported back to Austin Energy’s grid, and excess chilled water is distributed to a half-dozen other nearby facilities. With such a robust gas turbine microgrid able to meet such a range of needs, it might be easy to lose sight of Seton’s other goal. But the use of a CHP facility was critical for meeting Seton’s sustainability goals. The rationale of a CHP plant is that it derives maximum efficiency from a single fuel. It burns gas to make steam to turn a turbine and run a generator and, rather than exhausting the steam, captures it for use as steam—for sterilization in the hospital for instance. The gas turbine at the heart of the system is the key to meeting those goals. It is highly efficient, with a heat rate of 6,700 British Thermal Units per kWh. According to the Department of Energy the average heat rate for a gas turbine fired by natural gas in 2015 was 11,302 BTU/kWh. The gas turbine also has low emissions, less than five parts per million for nitrogen oxides, without the need for exhaust flue injections, according to Story. Compared with Austin’s overall fleet average, the CHP unit reduces carbon dioxide (CO2) emissions by 47 percent. Compared with a typical coal plant, it cuts CO2 by 72 percent and can reduce sulfur dioxide emissions by as much as 99 percent. The emissions profile of the gas turbine at the center of the CHP plant was one of the reasons cited for achieving the maximum 10 points allowable under a U.S. Green Building Council credit system for green buildings, which in turn allowed the Dell Children’s Medical Center to become the first hospital in the world to win a Leadership in Energy & Environmental Design (LEED) platinum certificate. I think the word sustainability is being misused here. Natural gas is a fossil fuel and thus contributes to global warming & climate change — not sustainable. While natural gas burns with less CO2 output than other fossil fuels, the leakage of methane from the entire system — from drilling & fracking to transmission to market — results in a total GHG impact that is about equal to burning coal. Not sustainable.